Overall Rating: 6 - It's a nice kit considering the price and age of this model, but not for the easily discouraged. I don't consider myself much of a modeler, but I really like Miyazaki Hayao's Kaze no Tani no Nausicaä manga, so I simply couldn't resist the Tsukuda Nausicaä kits. The kit has parts for Nausicaä and her Mowe. 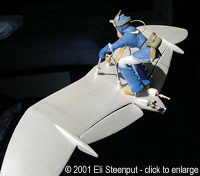 For those unfamiliar with the story, a Mowe is a very neat cross between a delta glider and jetpack. It has VTOL capabilities, jet propulsion, can be flown as a kite, and can be carried by a single person. The wings also fold. Nausicaä is of course the heroine of the story. The model seems to be mostly based on the cover art for the first volume. The Mowe seems to be the later manga version (without the vortex generators on the wings seen at the start of the story). There is a clever base included that allows you to set the model at a wide range of banking angles, without needing any support holes. Two remodeling options are proposed in the instructions; an opened maintenance hatch - you have to cut out the hatch yourself, but there is some interior detail provided on the engine; and folded wings. The hatch configuration doesn't seem very well supported by the references, and the execution of the folding wings is plainly inaccurate: the aileron/flaps should fold in the same location as the wings. Unfortunately the inaccurate lines are engraved on the flaps and should be removed if you care about accuracy. Two parts are included for optional open vtol exhausts, which I didn't install. 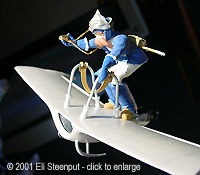 Nausicaä herself appears dressed as on the cover art for the first volume. An optional helmet, gasmask and Teto (the squirrel) are provided. For those preferring to recreate actual events from the story, valid configurations would be: with gasmask only, with Teto only, or with both gasmask and helmet (and Teto, but then he should look as if he's choking...) although for the last combination she appears to be missing her pistol. Because of the extremely dorky facial expression on Nausicaä I chose to install the gasmask. The fit of the Mowe is poor, especially where the two upper wing halves meet in the middle. The engine exhaust is not symmetrical (fortunately you'll hardly ever see it). The engine interior doesn't at all fit to the exterior shell (if it was supposed to, they really messed up). I'm used to pins that don't fit their holes, but here the difference was quite considerable. If you like a challenge then this might be something to your taste; my own modeling skill being rather limited I didn't even attempt to fix the asymmetrical exhaust and the not-very-accurate cross-section profile (very unlikely that anyone ever seeing the model will even know what it represents anyway, let alone notice the accuracy). 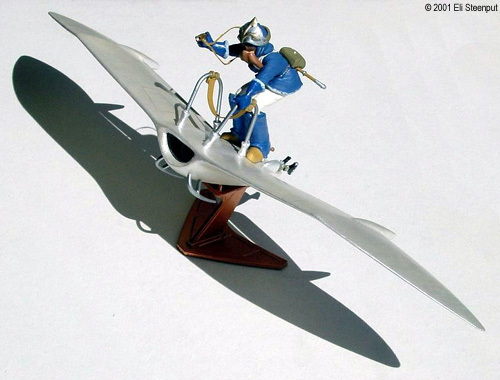 Parts for Nausicaä weren't much better. The quality of this kit seems to be lower than the Nausicaä on Kai I reviewed earlier. A lot of the detail requires some amount of surgery to make it look acceptable. I had to correct most detail on her flight cap flaps, as the stubs were located there. Fitting the gasmask required plenty of filler. There was also a big gap where the head and torso are supposed to connect. It's advisable to fill the hollow back of the belt pouch, as it remains visible when installed. There are no orientation guides or indications to help you position her arms or legs (which is probably just as well, considering the fit of the rest of the kit). 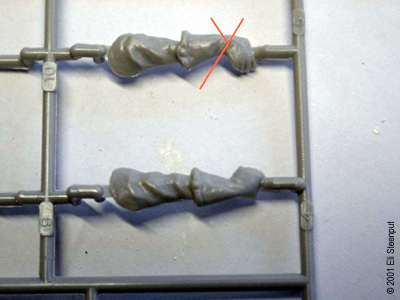 As a consequence you will have to glue on her arms and lower legs while making sure everything fits with Mowe. Even so I didn't manage to get both her feet completely flat on the Mowe's hull. 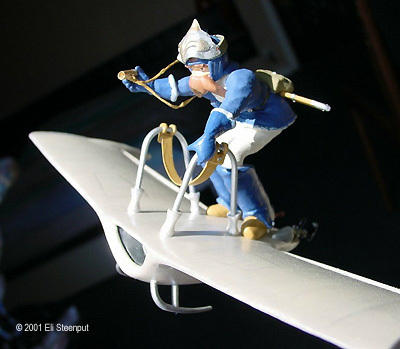 I think you are not required to cement Nausicaä onto Mowe, but I superglued her on anyway (reflecting my level of trust in visitors not touching my models). To make the pose a little more dynamic, I performed some surgery on Nausicaä's right arm, changing the angle of the wrist, with the idea of showing her holding a wormflute. I carved a detailed wormflute from sprue, based on my references, but upon assembly I saw I had misjudged the actual angle the arm could reasonably take, so I ended up using a smaller, much simpler version (that didn't actually whistle). I used a 'mother of pearl' for Mowe, in an attempt to give it a more 'ceramic' look. This was a waterbased paint I hadn't used before, called Marabu Decorlack. It was more transparent than I expected, and I'm not really happy with the result (oh elusive perfection, ...). The other colors used were enamel paints from Revell. I used silver (90) for the landing skids and control bars, and silver and iron (91) on the engine. The belt is ochre (88). On Nausicaä I used white (4) and (5), blue(51) and (56), ochre (88), silver (90), gold (94), copper (93), red (31), black (7) and (8), and flesh (35). 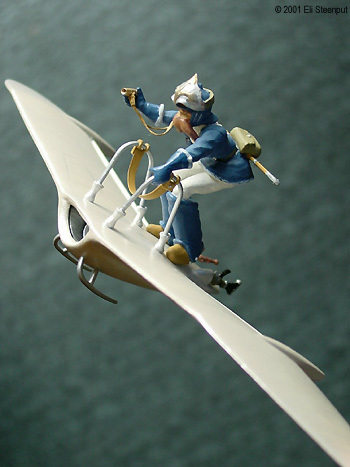 I didn't do much weathering because Nausicaa, being the chieftain of her people, would not fly around on a dirty glider. I only used some pencil dust in some of the panel lines. This page copyright © 2001 Starship Modeler. Last updated on 28 June 2001.